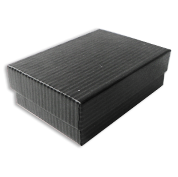 Shop our elegant collection of Black Pinstripe cotton filled gift boxes for your precious jewelry: for rings, necklaces, bracelets, earrings, pendants & more. Perfect for jewelry packaging & retail sales. Transform the way you showcase your pieces and get the best deals thanks to our wholesale discounts!